“The Girl in the New City”! My first thoughts was if this actually is a very apt title for my write up. Having been born and brought up in the City Of Joy, to get my SIP location as Kolkata seemed sort of Run-Of-The-Mill. But the last seven weeks made me change my opinion radically. 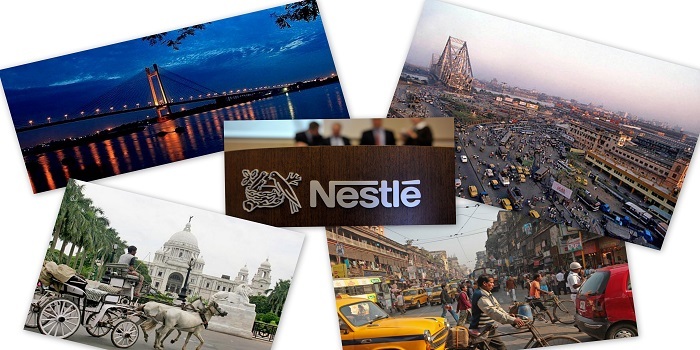 So here I am to sum up my Internship experience so far in the global giant Nestle India Limited. When on the 18th of April the journey actually started, my hopes were pretty high! Right from the beginning the experience was in one word- AMAZING! I knew I couldn’t have asked for anything better. It started with the Royal Treatment in Gurgaon during the Induction. That came to an end only to kick start the actual roller coaster ride back in my hometown. I sensed in the true sense what it takes to be “On The Go”. In a span of six weeks, I visited some 35-40 odd new places in and around West Bengal (Some of which I didn’t even know existed!). And that is when I discovered a Kolkata within Kolkata. I remember on the first day Nescafe’s Marketing Manager, Aseem Sethi had advised us that in order to have a successful sales and marketing career you need to know how to love people. It’s as simple as that! Now I know how true his words were. After having interacted with over 140 people (distributors, retailers, consumers, employees of different companies besides Nestle) as a representative of Nestle I realized that stakeholders pay back to the company only if they receive the same from the company. It’s not just about the monetary incentives but much more. The key to Nestle’s success is that it cares for its stakeholders, precisely the why the company celebrated 100 years of its existence in our nation and will continue to roll in the years to come. Before starting off my journey I had interacted with some people (either interned with this company or worked here). One thing common in what they said was that the organization is extremely employee friendly. I now know that this statement is true to its core! For a fresher who had zero knowledge about the FMCG space it wasn’t supposed to be an easy journey. And it wasn’t! But thanks to my superb mentor and amazing project lead, I sailed through it all. From explaining the robust distribution process to answering the silly queries I had, they did it all. It truly is a humble organization to say the least. I don’t know what the future holds but this journey will surely be cherished! I’m a little leaner and a little darker now (thanks to the zillion field visits) but it was all worth it! What I’ve learnt here is way more than what one year of MBA taught me. So with just one week left and the final review remaining I take this opportunity to thank Nestle India Limited. Thank You for this summer sojourn. Thank You for the royal treatment, goodies and for making my summer of 2016 so special. Signing off the Nestle Way- Good Food, Good Life and Good Luck to All! !